Scheduled Pool & Spa servicing – to suit your every need. Casual Care – for those unexpected problems. Vacation Care – for peace of mind while you are away enjoying your holiday. Damage Control – for when water quality is suspect – we can fix it! 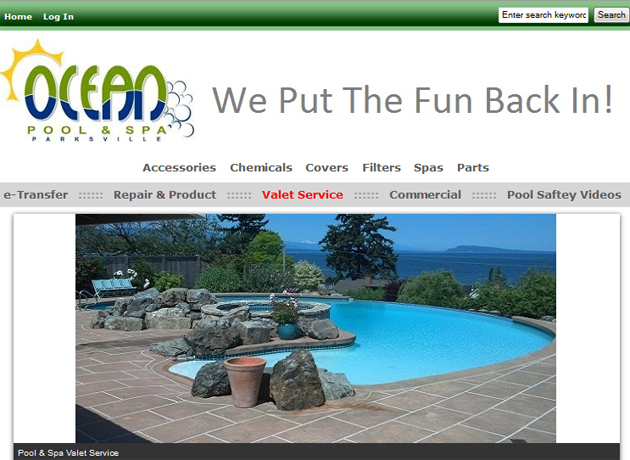 Special occasion cleaning – we can ensure your pool is looking great! Pool advice and assistance – for those who are new to pools. Now you can ensure that your pool/spa is professionally maintained without breaking the budget with The Pool & Spa Valet Service. We’ll come right to your door guaranteeing health and safety as we only use the highest quality chemicals in accordance with Health Canada. You will always get personal attention from the our technician who will service your pool/spa to keep it clean, safe and healthy all year round. Finally, your valuable equipment can be properly maintained so it won’t let you down when you need it most and our experts will also be able to replace anything should the need arise. Maintaining the correct chemical balance is the essential ingredient for a healthy pool/spa regardless of whether the pool/spa is sanitized by chlorine, salt chlorination, bromine, ozone or any other system. Having professional pool/spa servicing and pool/spa maintenance is a great way to enjoy the pool/spa facilities throughout the year that too without any intensive hassle. The Pool & Spa Valet Service provides many options of pool/spa servicing, designed to suit the needs of every individual client whether it is residential, rental, commercial or holiday home.